Rosalie Gascoigne is renowned for her sculptural assemblages of great clarity, simplicity and poetic power. Using natural or manufactured objects, sourced from collecting forays, that evoke the lyrical beauty of the Monaro region of New South Wales, her work radically reformulated the ways in which the Australian landscape is perceived. Born in New Zealand, Gascoigne graduated from Auckland University in 1937 and worked as a teacher before moving to Australia in 1943 following her marriage to astronomer Ben Gascoigne. 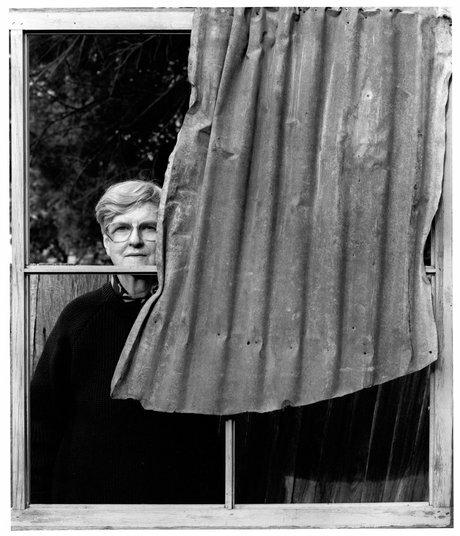 She discovered a natural talent for creating assemblages through the ensuing 17 years spent in relative isolation on the stony terrain of Mount Stromlo, home to Stromlo Observatory, and the wheat belt of Monaro near Canberra, a landscape she designated as the crucible from which her art emerged. Her exposure to the Australian environment, which she once described as ‘all air, all light, all space and all understatement’, was crucial to the development of her sculptural practice. Gascoigne’s lifelong passion for collecting and arranging developed initially from the Sogetsu school of ikebana, with its emphasis on form and line rather than colour. Its general principles of valuing immediate response, the experience of materials, process and experiment with variations can be seen as underpinning all of her later work. The collection of discarded materials, such as farm machinery parts, for use as suitable vessels for her arrangements, led her to also make sculptural assemblages, a transition that coincided with the experimental direction of contemporary sculpture from the 1960s. Gascoigne had no formal art training, often asserting that her 50-year apprenticeship was in looking. She began exhibiting in 1974 at the age of 57. Her highly successful first solo exhibition, held at Macquarie Galleries, Canberra, was followed by an exceptionally rapid rise to recognition as one of Australia’s most celebrated contemporary artists. Early works from this era include The crop I 1976, which presents the viewer with hundreds of dried salsify heads that have been compressed, bound and arranged on an iron sheet. Symbolising Australian agriculture, the sculpture evokes the partitioning and cultivation of the land with its composition emphasising order and balance, recalling the structuring of Japanese brush fences and ikebana arrangements. My country is the eastern seaboard. Lake George and the Highlands. Land that is clean scoured by the sun and frost. The record is on the roadside grass. I love to roam around, to look and hear … I look for things that have been somewhere, done something. Second hand materials aren’t deliberate; they have had sun and wind on them. Simple things. From simplicity you get profundity. The weathered grey look of the country gives me a great emotional upsurge. I am not making pictures, I make feelings. Her choice of materials, whether manufactured or natural, always carried the imprint of their time in the land. 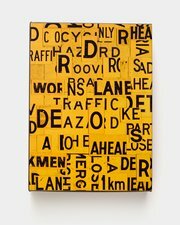 In addition to employing wood, corrugated iron, wire, feathers, enamelware and old soft-drink crates, Gascoigne’s later work also included road signs as epitomised in the large-scale Metropolis 1999. Cut up and assembled into a grid, the overlapping layers of signs confound with their competing verticals and horizontals, creating the effect of oncoming traffic and noise, of disjunction rather than coherence. The arresting contrast of yellow and black contributes to this visual overload, transporting the viewer to the metropolis of its title. At the same time, the materiality, dirtiness and wear of its surfaces are a reminder of the ad hoc nature of country road signs encountered in rural landscapes. A major survey of Gascoigne’s work was organised by the National Gallery of Victoria in 1978, followed by her representing Australia, with Peter Booth, at the 1982 Venice Biennale. Additional exhibitions include a touring survey organised by the National Art Gallery, Wellington, in 1983, a retrospective at the City Gallery Wellington in 2004, and at the National Gallery of Victoria in 2009.